Have you ever looked at a sports photo and thought of a funny caption? I have, and here’s a collection of some. If you enjoy this one, leave us a comment afterward. 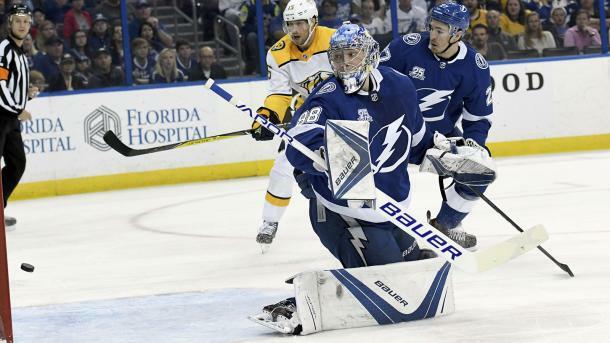 Billed as a possible matchup for the Stanley Cup Finals, the Nashville Predators discovered the best way to stop the Tampa Bay Lightning is to not allow their two top scorers from even getting a shot on goal. They did exactly that and came out ahead 4-1 in this April 1, 2018 (no foolin') contest. Filip Forsberg helped his Predator teammates with his 22nd and 23rd goal with the first being a powerplay variety. He also threw in an assist on Nashville's first goal by Ryan Johansen. Juuse Saros was in goal for Nashville and made 29 saves in the win. The Predators are the President's Trophy winner with the most points in the standings (117) and will definitely not be an eighth seed or underdog in the playoffs this season. In fact, it's not quite understood if any team will be able to stop them... they're just that good. 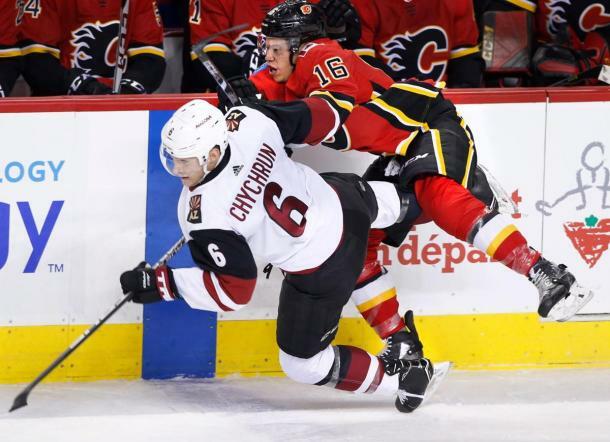 The Arizona Coyotes were as tough as kung-fu fighters in this April 3, 2018 game in the Saddledome in Calgary. They came out fighting and won the game easily 4-1. In fact, they took a 3-0 lead on goals by Richard Panik, Kevin Connauton, and Christian Fischer by the 2:18 mark of the second period. Connauton scored his 11th goal and added an assist to give him 21 points in the 73 games he wound up playing this season. Since he is an unrestricted free agent now, he was playing for a new contract... and he may get one. He showed some real offensive ability while still playing defense adequately. He had the best +/- stat on the team with a +3. That means he played an all-around good sensible game. As it turned out this was the last win for the Coyotes since they went on to lose the two remaining games to the Vancouver Canucks and the Anaheim Ducks. Connauton may have won himself a roster spot with his excellent play over the last month and a half of the season. He seems to have found his niche on this team, and if it's scoring or assisting on a goal, he has discovered how to be effective on the blueline. The Minnesota Wild certainly had no answer for containing the Los Angeles Kings' right-wing Dustin Brown as he went hog wild scoring four of his team's five goals. When the Wild scored a short-handed goal at 9:24 of the third period to tie the game Brown had to be wondering if his gigantic effort was all for naught. But never fear... Dustin Brown is here! He decided to win the game 23 seconds into the overtime and be done with it. The Kings really needed the win as they landed in the first wildcard spot to qualify for postseason play. They will go on to play the Vegas Golden Knights starting on April 11, 2018. That should be some series, and the Golden Knights need to watch Mr. Brown as he now thinks he is an offensive dynamo ready to make movies in Hollywood. He did finish with 28 goals and 63 points and helped his team win an important game. 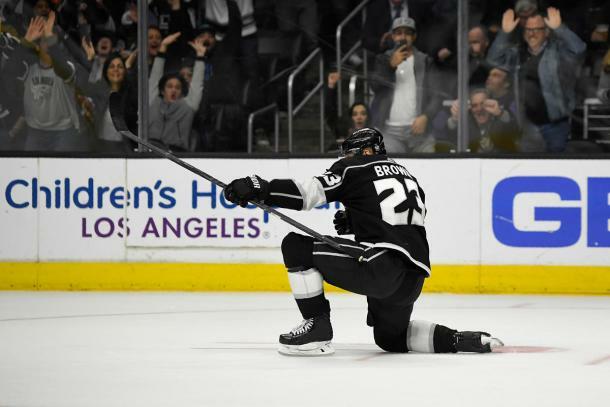 Don't forget he and his Kings' teammates must face the all-mighty Vegas Golden Knights, and that may bring Brown's confidence level down a notch or two. 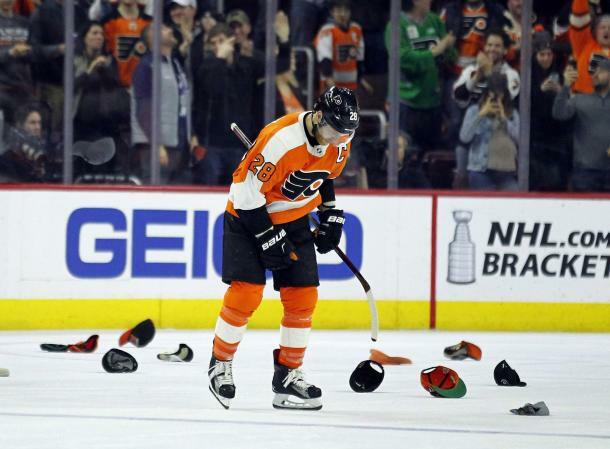 The Philadelphia Flyers Claude Giroux took matters into his own hands and wound up with a supply of hats to choose from in this April 7, 2018 game won by the Flyers 5-0 over the hapless New York Rangers. Giroux was so on target that he scored on every shot he took in this game to help solidify the Flyers hold on third place in the Metro Division. The season finale was great for the Flyers, but not so great for the Rangers, especially their head coach Alain Vigneault who was relieved of his duties after the game. The Rangers said they were rebuilding and it was not a good season for them as they missed the playoffs for the first time in seven seasons. For the Flyers, it now sets up a Pennslyvania playoff series which should be very entertaining. The Philadelphia team would love to dethrone the Pittsburgh team and prevent them from three-peating. 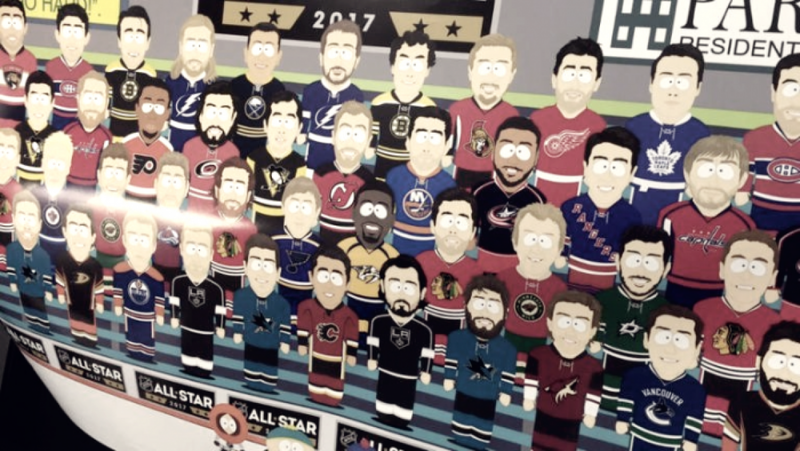 For Giroux, it marked a 102-point season for the captain, and he will be hard to stop in the playoffs as he has 62 points in 63 games.